This tab is used when the Numerator and Const fields are included. Mark the Yes/No check box to determine what payroll hour type will be exported. 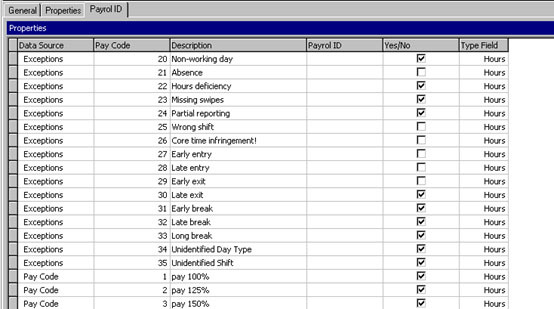 For each hour type, you enter the Payroll ID of your payroll software. Select a Field Type. The Field Type determines the data transmission format (quantity, hour, day). For breaks and transportation there is an additional format – Cost. Now, you can define additional fields according to your requirements: after choosing the relevant file, you can drag the relevant fields to the Export Record Format section. 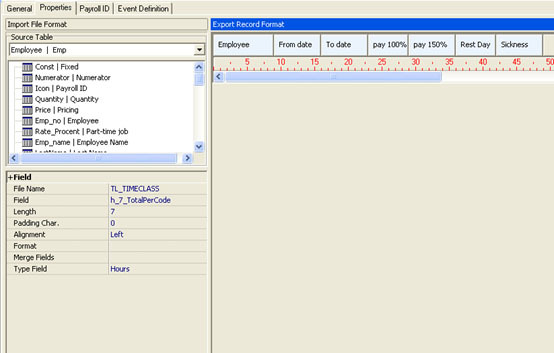 In addition to the payroll file you can also export data for use in other applications. 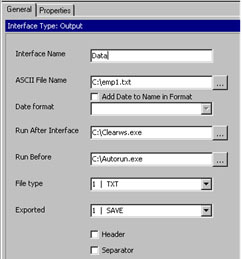 Create and name an Output Interface in the Interfaces option of the System Def. menu. For details go to the Routine Operation > Interfaces section of the User Manual.